The Swiss Alps are widely renowned as one of the most romantic destinations on Earth, known for their pristine snow-capped peaks, secluded ski resorts, and beautiful hiking trails. Major cities such as Zurich, Lausanne, and Geneva offer hip cultural attractions such as elite shopping districts, historic opera houses and theaters, and former Olympic sites, while quaint villages such as Zermatt and Andermatt provide direct access to ski slopes and day-excursion trains. Couples looking for upscale getaways can choose from elaborate resorts providing luxury spa and fitness amenities, modern boutique hotels emphasizing contemporary decor and architecture, or quiet mountaintop and lakefront chalets offering a respite from heavily-touristed regions. Park Gstaad, which was originally opened in 1910, offers timeless Swiss ambiance and architecture that incorporates the surrounding scenery of the Swiss Alps into its design. Mountain and forest views are offered from modern rooms and suites featuring black granite bathrooms, in-room safes, and complimentary minibars. Four restaurants serve contemporary local and international fare, including the upscale Avenue Montagne, the garden terrace Chalet Waldhuus, and Caveau, which focuses on food and wine pairings. A cigar lounge and club bar also offer extensive cocktail menus in relaxing atmospheres. A spa features onsite hairdressers and hydrotherapy and Turkish baths, and a fitness center showcases a PGA Tour simulator golf range. Carlton Hotel St. Moritz takes luxury accommodations to the next level, offering complimentary butler service, 24-hour limousine service, and daily food and beverage credits to all guests. It was constructed in 1913 and overlooks Lake St. Moritz and the majestic Swiss Alps, providing convenient access to natural attractions such as Via Alpina’s hiking trails and Piz Nair mountain. Spacious and elegant junior and full suites offer panoramic views and amenities such as flat screen televisions, separate sitting and kitchen areas, and free wireless internet. The Da Vittorio-St.Moritz restaurant offers gourmet meals by Michelin-star-awarded chefs Enrico and Robert Cerea, and a lounge and bar offers fireplace and terrace seating. Other amenities include a three-level spa, indoor and outdoor pools, and access to top area skiing schools and excursions. Boutique Hotel Matthiol is a classic mountain chalet and ski lodge located in Zermatt’s Winkelmatten district, offering exceptional views from the base of the iconic Matterhorn mountain. 23 recently-renovated standard, double, deluxe, and spa suite rooms are decorated in rustic stylings emphasizing wood and stone elements, offering amenities such as balconies with mountain views. Guest facilities at the lodge include a full-service upscale restaurant serving traditional recipes crafted with locally-sourced ingredients and a large list of fine wines. For a unique romantic dining experience under the stars, guests may reserve the heated outdoor Fondue Igloo. Breakfast is served daily, and afternoon tea service is available, featuring pastries and 17 different types of tea. 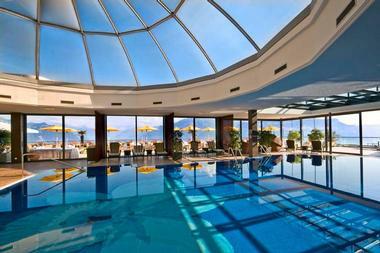 Other amenities include a full ski school, a spa with sauna and whirlpool, and a fitness center. 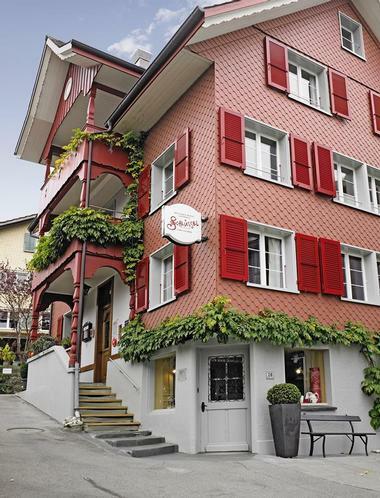 Boutique-Hotel Schlüssel was central Switzerland’s first boutique hotel, serving guests since 1820. The hotel offers 12 individually-decorated rooms showcasing views of Lake Lucerne and the Alpine mountain range, offering amenities such as wooden floors, freestanding bathtubs, stylish sinks and showers, and a selection of DVD films. A hotel restaurant offers a daily menu featuring seasonal dishes made from locally-sourced ingredients along with a variety of local wines and spirits. On Wednesdays, a special romantic getaway reservation package is available, which includes a complimentary bottle of wine and rose petals spread across guest suites’ beds and bathtubs. A variety of cultural events are hosted at the hotel throughout the year, including musical performances and culinary events, and private wedding rental packages are available at any time. Caffè dell'Arte Boutique Rooms offer a unique taste of Mediterranean flair and hospitality, located in the historic district of Locarno within Switzerland’s Italian-speaking Canton Ticino region. The nine-room bed and breakfast is within walking distance of the Piazza Grande di Locarno, which is host to a number of high-profile local and international events throughout the year. The historic 15th-century facility offers individually-decorated rooms with amenities such as private bathrooms, minibars, flat screen televisions, and free wireless internet. Some rooms also offer balcony access. Breakfast is served daily for all guests, crafted from locally-sourced ingredients, and hot chocolate, tea, and coffee are available throughout the day. Other guest amenities include a large enclosed visitor courtyard area and an upper-floor art gallery operated by the Art Gallery Patrizio Patelli Foundation, which uses its sales proceeds to support local social outreach programming. Carlton Lausanne Boutique Hôtel is perfect for couples looking for an indulgent getaway in the heart of Lausanne’s cultural attractions, located minutes from the Musée de l'Élysée, Lake Geneva, and the city’s Olympic Museums. 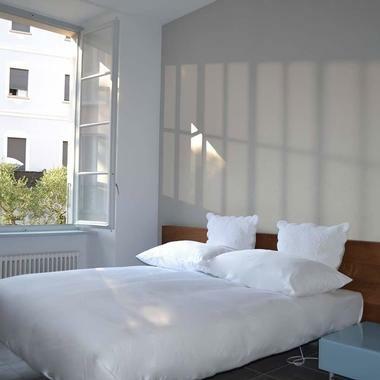 The hotel has operated since 1906 and has been the preferred hotel of celebrities such as Serge Gainsbourg and Nina Hagen, offering all the luxury amenities visitors have come to expect from the Carlton brand in the intimate environment of a boutique hotel. 47 sophisticated guest rooms and suites offer signature Elite bedding, marble bathrooms, furnished balconies, and amenities such as minibars and flat screen televisions. The hotel’s L’Ardoise brasserie serves gourmet French fare, while a bar and lounge stocks fine wines. CERVO Mountain Boutique Resort offers seven spacious alpine chalets overlooking the Matterhorn mountain, accessible via Zermatt’s Sunnegga Cable Car. The resort is the perfect choice for visitors looking to hit the slopes during their Switzerland stay, providing direct access to a number of area ski slopes, and is conveniently located less than 10 minutes from the Zermatt train station. Many of the resort’s spacious chalets offers deluxe amenities such as wellness areas with saunas and steam baths, complimentary minibars, and private balconies. Free breakfast is included with each night’s stay, and local dishes are served at the CERVO Puro and Ferdinand restaurants, including vegetarian options. 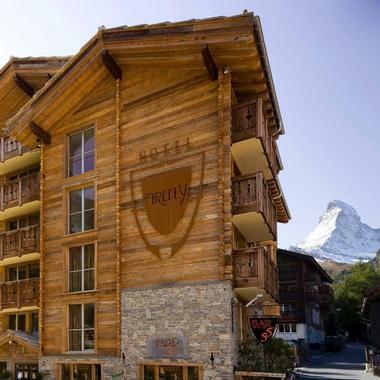 Europe Hotel and Spa Zermatt is a charming modern Alpine lodge conveniently within walking distance of the Zermatt-Furi Ski Lift and the Matterhorn Glacier Paradise Station. The hotel creates a rustic-chic atmosphere through stone and wood decor elements and features individually-furnished rooms with floor-to-ceiling windows offering spectacular mountain views. Standard rooms come with flat screen televisions, minibars, and free wireless internet, while annex apartments offer private kitchens and balconies. Buffet-style breakfast is included with each night’s stay, and a European-style restaurant serves traditional five-course gourmet dinners. After dinner or a long day on the slopes, guests can relax in a reading room with an outdoor fireplace or receive free massages at the hotel’s spa and sauna facility. Kulm Hotel St. Moritz was the GaultMillau Hotel of the Year in 2018, one of the hotel industry’s most prestigious annual awards. 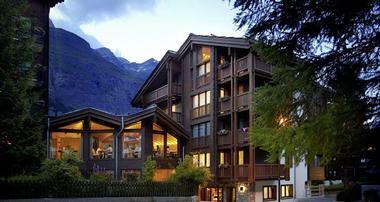 The picturesque Engadine hotel was founded in 1856 and was one of the pioneers of Swiss Alps winter tourism. Luxury rooms and suites highlight marble bathrooms, wood ceilings, and private fireplaces, offering balconies and lake views from select rooms. Five onsite restaurants serve a variety of international cuisines, including French, Japanese, and Italian menus, and the newly-renovated Kulm Spa St. Moritz offers indoor and outdoor pools, a Kneipp footpath and salt grotto, and full sauna and fitness centers. During the summer months, a nine-hole golf course hosts a pro academy, while in the winter, a private skating and curling rink are available. Fairmont Le Montreux Palace is a prime destination for sophisticated travelers, as one of the most prestigious and largest hotels within the Swiss Riviera. 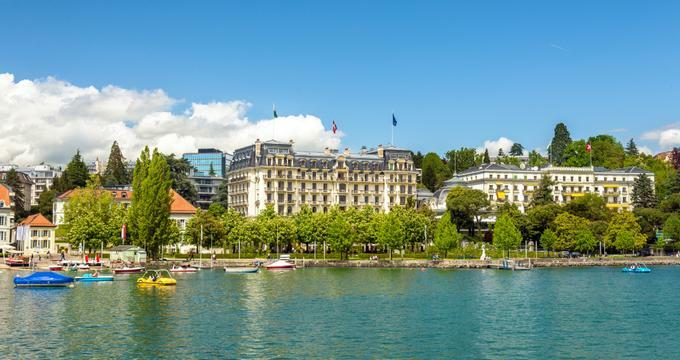 The hotel was constructed in 1906 and is located on the shores of the world-famous Lake Geneva, showcasing gorgeous Belle-Époque architecture and offering five-star amenities. 236 rooms and suites may be rented, furnished with flat screen televisions, coffee makers, and offering upgrades such as private balconies and living rooms. Several upscale dining venues are destinations in their own right, including Funky Claude’s Bar, La Terrasse du Petit Palais, and Montreux Jazz Café. The hotel’s 15,000 square feet of convention and ballroom space is host to several major annual events, including the famous Montreux Jazz Festival and a holiday Christmas Market. Hotel d'Angleterre Geneva is the city’s only five-star boutique hotel, offering distinct British character with everything visitors expect from Swiss hospitality. The hotel overlooks Lake Leman’s Jet d’Eau and is less than a four-minute walk from the beach, also offering convenient access to nearby attractions such as the United Nations Headquarters, St. Pierre Cathedral, and the Rue de Rhone. 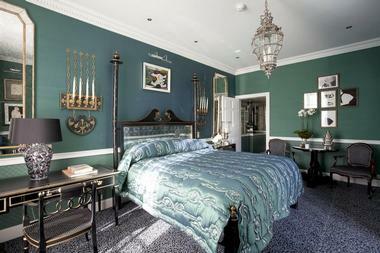 Elegant rooms and suites are decorated with refined furnishings and provide lake views from private balconies. The Windows Restaurant serves Swiss and international fare, while the Leopard Room Bar serves custom cocktails and hosts live music six nights a week. Other amenities include an onsite fitness center with private yoga sessions, 24-hour room service, and an upscale cigar lounge and wine cellar. 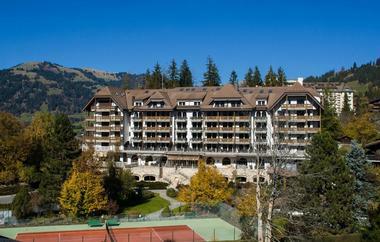 The Alpina Gstaad is a five-star hotel within the Bernese Alps that offers unique amenities such as a private movie theater and a modern art collection. 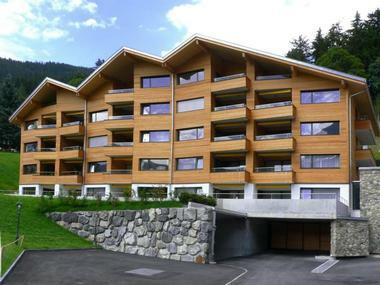 The hotel was opened in 2012 and features chalet-style Swiss Alpine architecture emphasizing sandstone, marble, and aged wood elements. Designer rooms and suites contain private balconies, carved wood ceilings, floor-to-ceiling windows, and private libraries, lounges, and fireplaces. For larger group getaways, a three-bedroom split level suite features its own gym, spa, and kitchen areas. Three fine-dining restaurants are offered on site, including the Japanese-style Megu, the upscale Sommet Restaurant, and the local-fare Swiss Stübli. 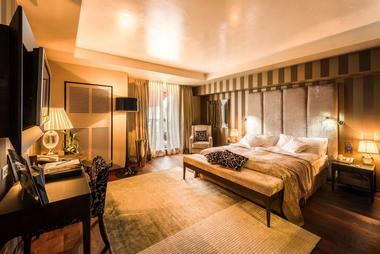 Other guest facilities include a Havana-themed cigar lounge, a wine cellar, and the Six Senses Spa. 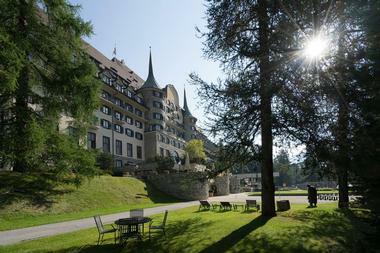 Hôtel des Trois Couronnes has hosted luminaries such as England’s Princess Marie-Louise, composer Pyotr Ilyich Tchaikovsky, and silent film star Charlie Chaplin throughout its two centuries of operation, making it a top choice for couples looking for a world-class Switzerland travel experience. 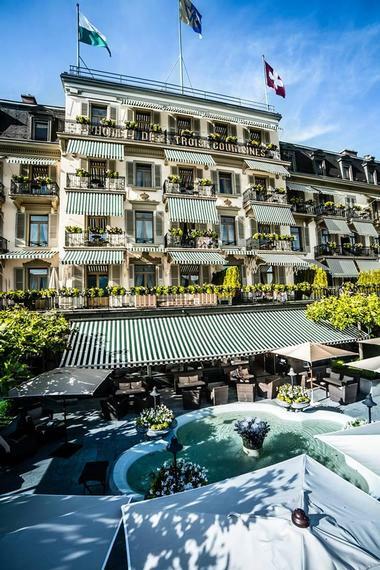 The opulent palace-style hotel is located within the heart of Vevey, just over a 10-minute walk from the shores of Lake Geneva, and offers easy access to the nearby Gruyère and Lavaux vineyard region. 71 spacious, individually-decorated rooms are available, including executive and junior suites that feature separate living and dressing room areas. The hotel’s Michelin one-star restaurant offers seating on a grand panorama terrace and serves French and Mediterranean cuisine, while its Puressens Spa features a Turkish bath, a swimming pool playing underwater music, and a Baroque-style fitness center. For visitors seeking cultural experiences, the hotel is conveniently located near the venues for events such as the Montreux Jazz Festival, Musical September, and the annual Images Festival. Hotel Firefly combines all the luxuries of a four-star resort with the intimate charm and attention to detail of a family-owned hotel. 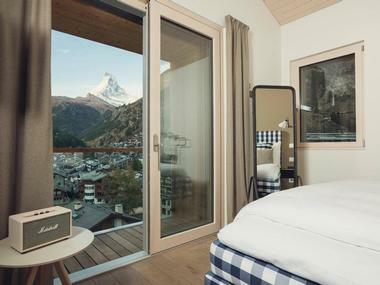 The hotel is located at the foot of Matterhorn mountain, within walking distance of the Klein Matterhorn cable car system, the Matterhorn Museum, and the Zermatt train station. Chic suites sleep two to 12 guests and are designed around the concept of the four elements, featuring private balconies, sitting areas, and fireplaces. Complimentary a la carte breakfast is included with each night’s stay, and a hip restaurant and bar features a wine cellar. In addition to standard amenities such as indoor and outdoor pools and a fitness center, the hotel also offers a climbing wall for guest use. Hotel Giardino Lago is perfect for couples looking for a laid-back escape from Switzerland’s tourist sites, located in Minusio within the Locarno district, along the banks of Lake Maggiore. 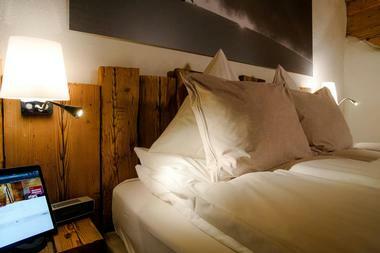 The hotel emphasizes sustainable tourism practices and a high quality of living in an intimate boutique environment. 14 uniquely-designed rooms blend modern and traditional styling, highlighting Designers Guild fabrics, oak parquet floors, and glass design elements. Modern fusion cuisine with Mediterranean flavors is served at the Ristorante Lago’s lakeside terrace, while a rooftop lounge offers opportunities for sunbathing. Complimentary guest amenities include bicycle and deckchair rentals for the duration of visitor stay. Hotel Suvretta House St. Moritz prioritizes classic Swiss hospitality, offering a five-star experience in a luxurious facility within the Suvretta nature preserve. For couples looking to experience the outdoor splendor of the Swiss Alps, the hotel offers convenient access to the Suvretta-Corviglia winter sports region, the Via Alpina hiking trails, and Piz Nair mountain. Elegant rooms and suites create a refined ambiance and emphasize natural light elements, featuring amenities such as parquet floors, marble bath detailing, and private living room areas. Its Grand Restaurant is located within an oak-panel dining hall and serves gourmet Swiss specialties, while a Club Bar and library lounge provide sophisticated opportunities for relaxation after a long day on the hiking trails or the slopes. A children’s restaurant, indoor and outdoor play areas, and babysitting services are also offered for couples traveling with families in tow. 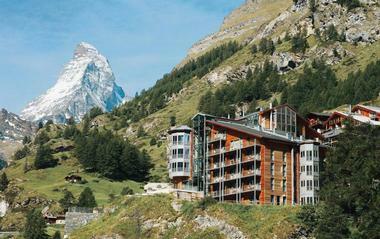 Hotel The Omnia is located less than a 10-minute walk away from top Matterhorn region attractions such as Matterhorn Ski Paradise and the Gornergrat Alpine railway. The contemporary hotel is elevated above the Zermatt skyline and adapts the concept of an American mountain lodge with European flair, featuring stylish design by New York architect Ali Tayar. 30 guest rooms are available, including 12 suites with bay windows and unique amenities such as personal-use telescopes. A contemporary restaurant serves international dishes and offers indoor and outdoor terrace seating, while a hip club presents regular live music. Complimentary breakfast is included with each night’s stay, and a private shuttle service transports guests to and from the nearby Zermatt train station. Lausanne Palace and Spa was constructed in 1915 and has become an integral part of Lausanne’s cultural heritage over the past century. 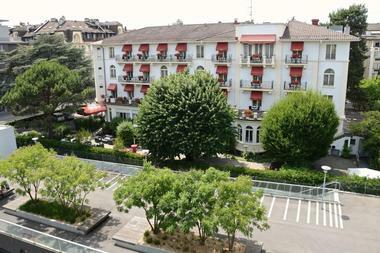 The elegant five-star hotel is located within the heart of the city’s business district, less than a 10-minute walk from top attractions such as the 12th-century Lausanne Cathedral. Upscale rooms and suites showcase splendid views of Lake Geneva and the Old Town, featuring amenities such as marble bathrooms, private balconies, and complimentary minibars. Four restaurants are offered on site, including the Michelin one-star La Table d’Edgard and the Japanese-style Palace Sushi Jen. Relaxation options include the Aveda Beauty Center, which features a Pilates center and a luxe spa, and three hotel bars. Le Mirador Resort and Spa offers a five-star resort experience within the beautiful Lavaux vineyards, a UNESCO World Heritage Site. 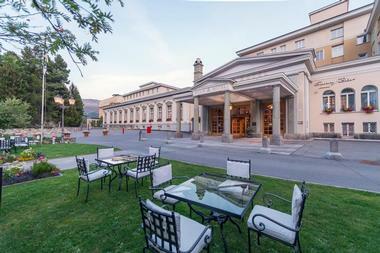 The intimate boutique spa resort is a tranquil oasis atop Mont-Pèlerin, offering 63 antique-furnished rooms and suites with panoramic views of the nearby Rhone Valley and luxury amenities such as interactive entertainment systems, remote lighting controls, and multilingual plasma televisions. Both the Japanese-style Hinata restaurant and the locally-sourced Le Patio offer terraces overlooking Lake Geneva. Shuttle, limousine, and helipad service are offered for visitors looking to travel in exclusive style. Other amenities include a piano bar, a fully-equipped medical center, and a Givenchy Spa. 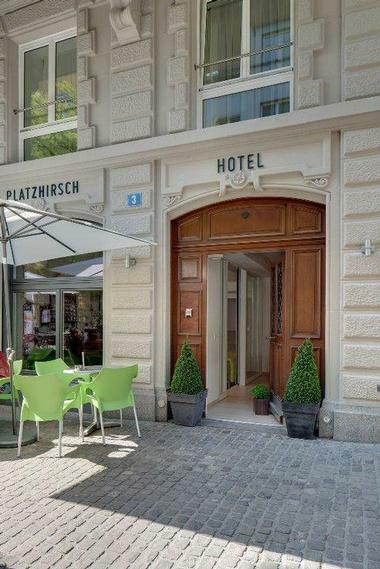 PLATZHIRSCH Boutique Hotel and Bar offers a chic, trendy adults-only boutique hotel experience in Zurich’s Niederdorf old town quarter, within walking distance of attractions such as Bahnhofstrasse street and the Swiss National Museum. 24 understated modern rooms and suites within a renovated historic building overlook the Hirschenplatz and feature upgrade amenities such as private balconies, Nespresso machines, and iPad use. Complimentary breakfast is available with each night’s stay within the hotel’s trendy first-floor bar, which offers seasonal outdoor boulevard cafe seating. Live music, private art exhibitions, and wine tastings are also showcased periodically at the bar, which also serves cocktails and coffee specialties. Romantik Hotel Schweizerhof Grindelwald takes luxury to the next level in an all-suite resort complex near the Grindelwald train station. 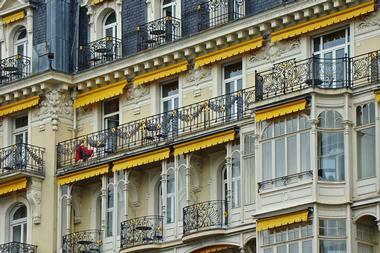 The hotel has been in operation since 1892 and is privately managed today as part of the Romantik franchise. 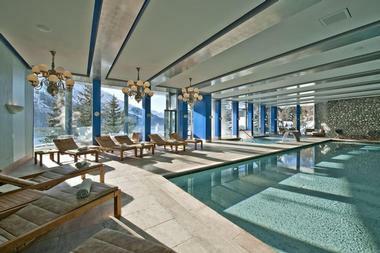 Chic suites and chalets connected by an underground tunnel system showcase panoramic views of nearby Eiger mountain and offer amenities such as flat screen televisions, sitting rooms, and fireplaces. For couples traveling with families in tow, family suites provide separate children’s rooms. A breakfast buffet is offered with each night’s stay, and gourmet meals are served nightly at the international-style Schmitte and Alpterassen restaurants and the local-fare Gast-Stübli. Vegan and kosher meals may be crafted upon request, and prayer rugs are available for in-room use. 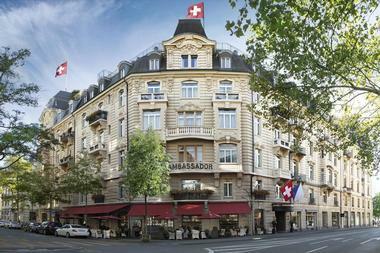 Small Luxury Hotel Ambassador a l'Opera Zurich is housed within the historic former Uto Castle, a neo-Baroque building which was constructed in 1898. It is located across from the famed Zürich Opera House within the city’s downtown district, less than 10 minutes from the Bahnhofstrasse shopping district. 45 sophisticated rooms and suites feature electronically-adjustable beds, Nespresso coffee makers, and upgrades such as private living room areas. The hotel is noted for its unique rooftop terrace, which provides spectacular views of Lake Zurich and the surrounding Alps. The award-winning Restaurant Opera serves sustainable seafood dishes, while the hotel’s intimate bar provides after-theater cocktails. The Chedi Andermatt blends classic Swiss ambiance with Asian-themed elements, located within Andermatt’s Alpine region near the Gemsstockbahn cable car station and the Nätschen ski lift. Wood, stone, and leather design elements accent luxury rooms and suites, which feature built-in fireplaces, private seating areas, whirlpool tubs, and mountain views from select rooms. The hotel’s restaurants serve European and Japanese fare, while a wine and cigar library provides opportunities for evening relaxation. Ski equipment rental and storage is available, along with standard and electronic bicycle rental and an exclusive sport butler service providing customized access to the region’s top summer and winter sports. 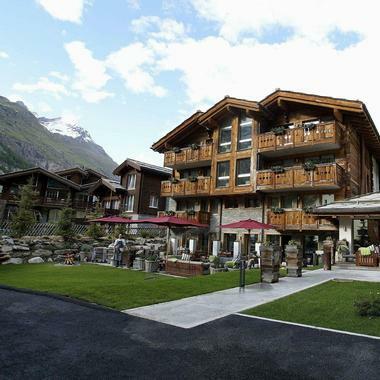 The River House Boutique Hotel is one of Andermatt’s top boutique hotels and has been ranked among the best hotels in the country, located near the Gemsstock and Piz Badus mountains. The rustic-chic resort features eight uniquely-decorated rooms with exposed wood beam design elements and amenities such as Nespresso machines, iPod docks, and free wireless internet, though visitors should note that televisions are not provided within rooms. Free continental breakfast is served with each night’s stay, and a gourmet restaurant serves after-ski fare. The hotel’s Andermatt Whisky Club also hosts exclusive whiskey tasting events, live music performances, and other cultural events. 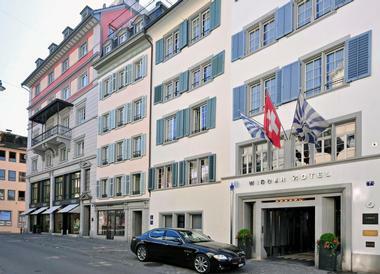 Widder Hotel is located within the heart of Zurich’s Bahnhofstrasse shopping street, spread across nine adjacent historic buildings. A wide variety of noted art and furniture by internationally-recognized artists is showcased throughout the hotel complex, including pieces by luminaries such as Andy Warhol, Le Corbusier, and Frank Lloyd Wright. All rooms are individually decorated and feature modern design and amenities such as complimentary minibars and complete B&O entertainment systems. Upgraded suites offer luxuries such as freestanding bathtubs, fireplaces, and private rooftop terraces. The GaultMillau-noted Widder Restaurant serves Swiss and international fare, and the Zur Schtund restaurant offers seasonal terrace seating. Other amenities include a library, a fitness center, and the Widder Bar, which hosts live jazz performances.